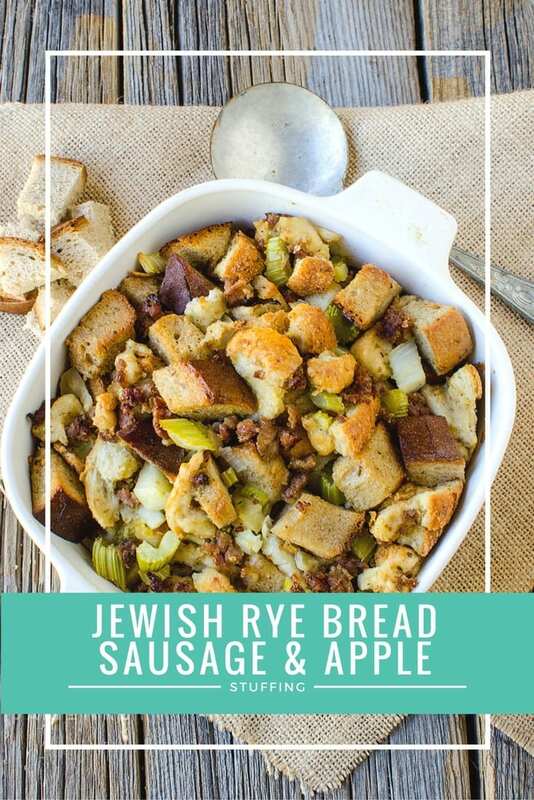 Jewish rye bread stuffing with sausage and apples makes the most flavorful side dish and perfect for Thanksgiving. Call it dressing, call it stuffing. Heck, you can call it slop, but I know you'll call it one thing after you try it. Really good! I've always been a sucker for Jewish rye bread. It's my favorite sandwich bread. So I thought I would experiment with it in a stuffing recipe. 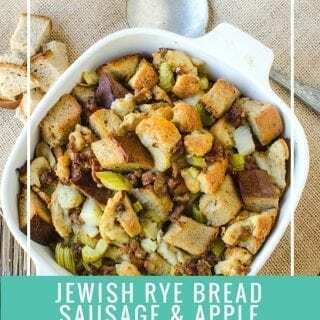 I've seen plenty of white and sourdough stuffing recipes but never Jewish rye bread. The difference between regular rye bread and Jewish rye is the addition of whole caraway seeds. This is what makes it stand out in the long line of bread. With this recipe, you can cut out a lot of extra seasonings and herbs because the bread speaks for itself. 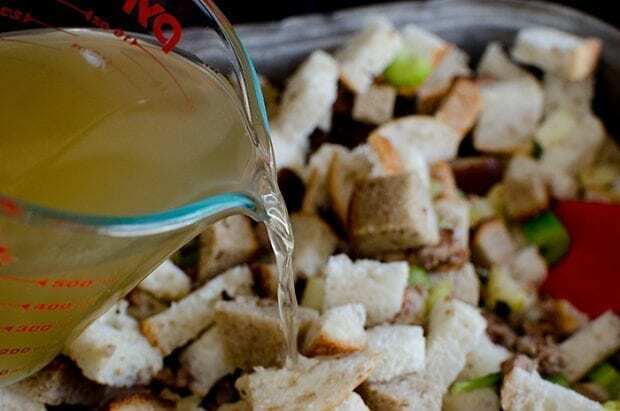 Cut your bread into 1-inch cubes – toss bread cubes in a large bowl so that the dark rye is perfectly mixed in with the white. This is the one time I don't skimp on the pork sausage. I don't eat pork on a regular basis but the flavors are rich, and you're eating it with Turkey so trust me on this one. In a skillet, cook and crumble sausage until cooked thru. Place on paper towels to drain. 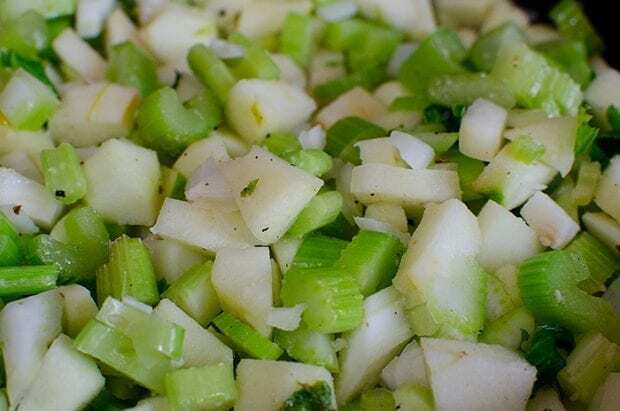 In the same skillet (locking that sausage flavor into everything), add onion, apples, celery, garlic, and butter. Sauté until apples and vegetables are tender. Toss the vegetables, apples, and sausage with your bread. Make sure it's good and mixed because once you add the broth, it will start to crumble. Stuff turkey just before baking and bake any additional stuffing separately in a greased 2-quart casserole dish. To bake stuffing separately, place in greased dish, cover and bake at 325 degrees for one hour; uncover and bake for 10 minutes longer. 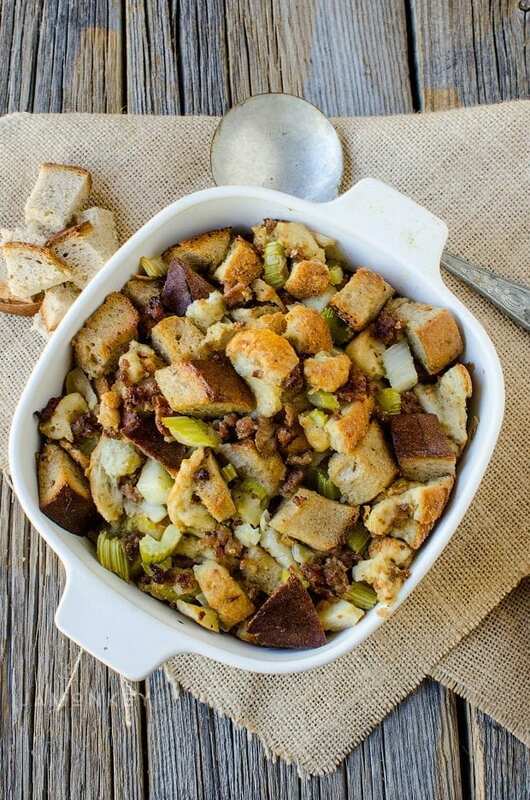 A flavorful stuffing dish for any meal. 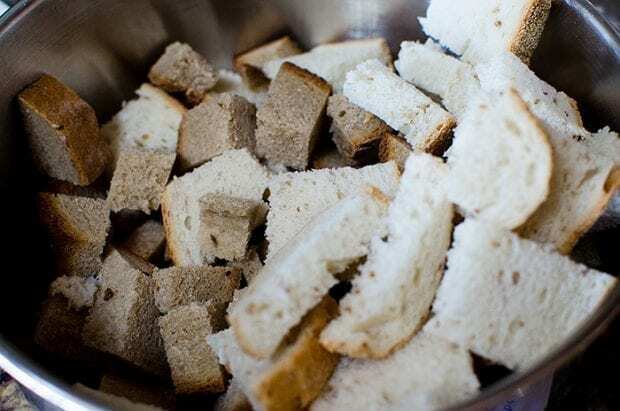 Cut bread into 1inch cubes - toss bread cubes in a large bowl. In a skillet, cook and crumble sausage until cooked thru. Place on paper towels to drain. In same skillet, add onion, apples, celery, garlic and butter. Saute until apples and vegetables are tender. Add the onion mixture and sausage to bread. Stuff turkey just before baking. Bake any additional stuffing separately in a greased 2 quart casserole dish. Oh yum! This looks delicious. I might have to make this for Thanksgiving! Mmm. I can taste the apples already – such a flavorful addition to the rye bread. I don’t normally like stuffing at all but with the addition of apples I may change my mind, sounds good! I thought it was the weirdest thing to put into stuffing for the longest time but the way these are cooked makes the apples more savory than sweet. It’s an amazing balance! That is such a good idea! I bet it does taste delicious. IF I ever make my own stuffing I would try this. We love Rye bread, with and without the seeds. Thanks! Rye is my favorite bread. This looks fantastic! I’ve never had Jewish Rye Bread, but this recipe sounds like it would be good with turkey at Thanksgiving! This recipe looks very tasty! I think it would be good stuffed inside an acorn or butternut squash. YUM! Oohhh and a beautiful presentation for dinner as well! OMG, this looks amazing. I am not sure if I can get my family away from regular ‘ol stuffing, but I am sure as heck gonna try. What an interesting recipe! It’s so nice to see something made with rye bread – it’s one of the favorites at our house. That sounds amazing. I love apple and sausage in my stuffing/slop. I love a good sandwich on Jewish rye bread. I never thought of combining the two. This is a Thanksgiving recipe to try. This is the first time I’ve tried it and I was very pleased! 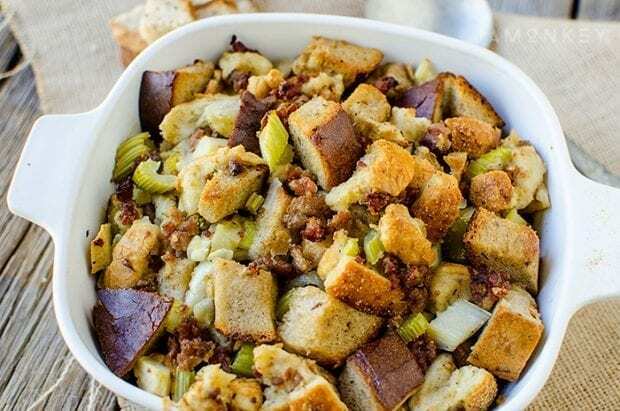 I never thought of using another type of bread in stuffing. That sounds like it cold be very interesting. It is amazing to me how many ways there are to make stuffing! This looks good! I’ll bet my boyfriend would eat the entire thing himself. It looks wonderful! 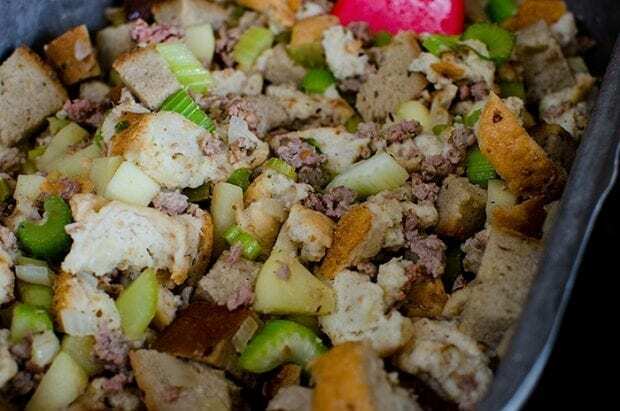 Stuffing is one of my favorites sides, never thought to make it with jewish rye bread! Great recipe! ohhhh yummy!! I can almost smell this cooking!! 🙂 Thanks for sharing! Pinning for later! As a Jewish person, I can say you did great! I would love to try rye bread stuffing. I never thought to use it before. Oh my – looks delicious! Stuffing (or dressing) is probably my favorite Thanksgiving dish. I didn’t know that the difference between regular rye bread and Jewish rye is the addition of whole caraway seeds. Interesting! My husband likes Jewish rye bread so I will try this recipe for him. Oh yum, that looks amazing!!! I love stuffing “Stove Top” kind, but I would love to try something different as long as it has some dried bread in it! I didn’t know adding caraway seeds made it Jewish rye bread. Who knew? This recipe looks perfect for the holidays – can’t wait to try it out.